Late October and early November in Sydney, the weather is changeable but in the past few years, the weather shifts have been more extreme. Last week, we went from fiercely hot, bush fire days with the air filled with smell of ash in the air, to super storms and snow in the mountains, and the cloud formations above Sydney looked like the mother ship was about to land. 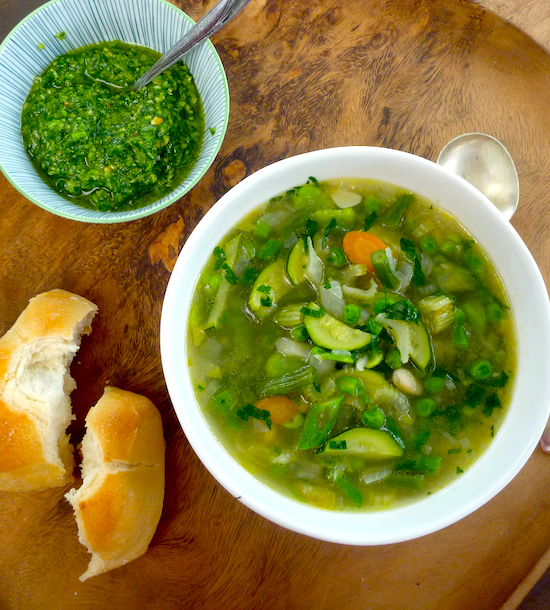 One good thing about these spring time cold snaps is that it extends the soup season and, in my house, we love soup. Last week, I made a pasta primavera with lots of spring vegetables, but my son wouldn’t eat it because it was to filled with suspect vegetables. But he happily ate this soup with some soup noodles, of course. 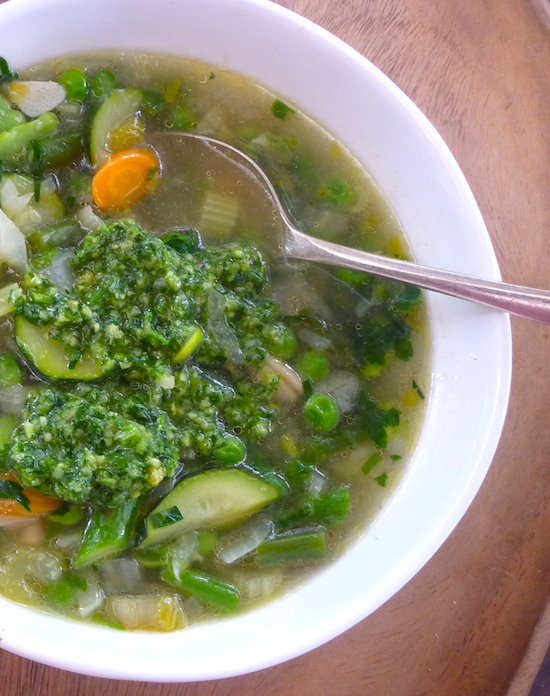 I love minestrone at all times but this spring time version is beautifully light and delicate. Because it doesn’t simmer away for hours, you will need a good stock with a decent depth of flavour to pull it all together. This is a Karen Martini recipe from her book EveryDay and she serves it with a rocket and basil pesto but I didn’t have any basil or rocket, so I substituted parsley and chives from the garden and it was really good. Add herbs, pinenuts and garlic into a small bowl of a processor. Process until finely chopped, gradually add oil until smooth. Stir through cheese and season with salt and pepper. Leftover pesto can be stored in a jar in the fridge, covered with a layer of oil to stop it discolouring. Heat oil and butter in large pan, saute onion, garlic, celery, and carrots until turning slightly golden. Add beans, zucchini and fennel saute for a couple of minutes or so. 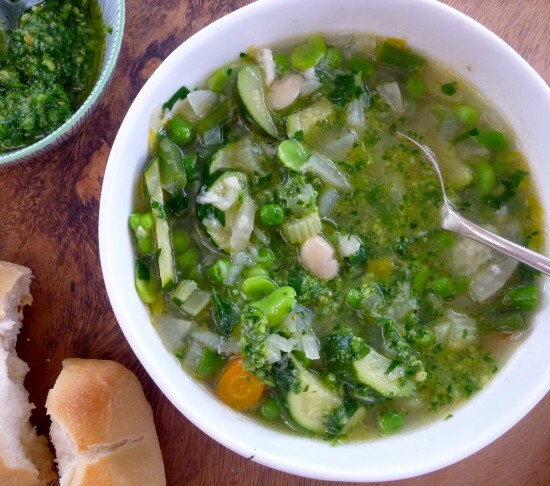 Add stock and cannellini beans, bring to a boil, add asparagus, peas, broad beans and parsley and simmer until just tender. The vegetables should be bright green. Serve with a dollop of pesto, extra olive oil and cheese if desired. Oh, I *love* the look of this. This looks lovely Elizabeth. I’ll have to give it a try for sure.